Pest description and crop damage The key pest of hazelnuts in the Pacific Northwest and a close relative of codling moth, one of the most economically important insects worldwide. 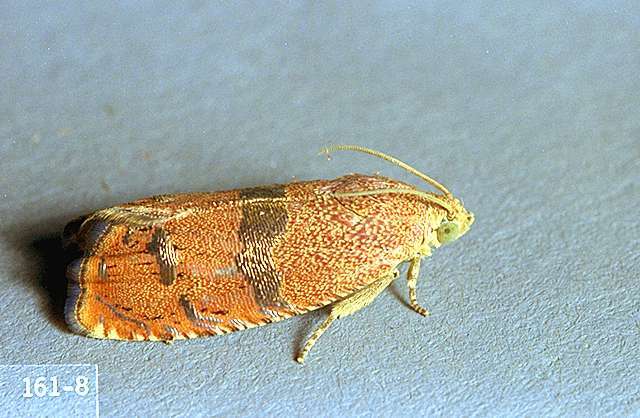 Adult moths are gray to reddish with golden bands across each forewing. 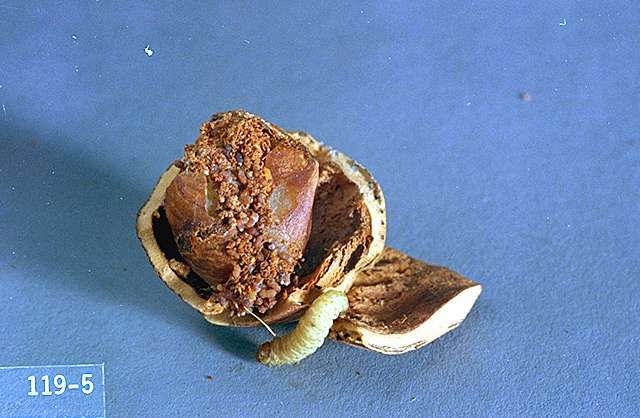 Larvae feed within the nut and destroy the kernel. 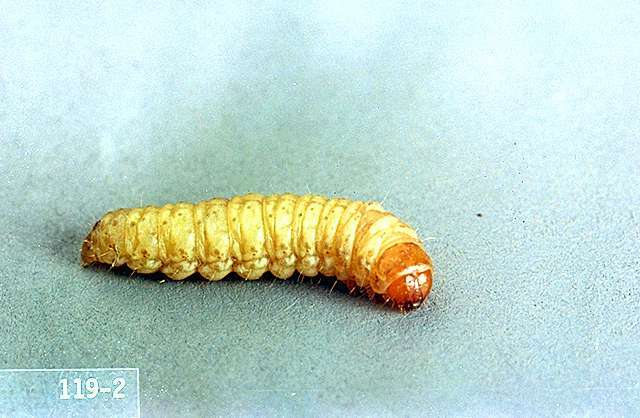 When fully developed, the larvae are whitish with a brown headcapsule and are approximately 0.5 inch long. The entry hole into the shell is not often seen, as the larvae gain entry into the kernel through the micropyle on the basal scar, but the much larger exit hole is apparent after the larvae has finished devouring the kernel. Research has shown that shell thickness at the basal scar can affect susceptibility of different hazelnut cultivars. Biology and life history The insect is found in many wild and cultivated nuts in North America but is particularly common in acorns and hazelnuts. The filbertworm overwinters as a larva in a silken cocoon. These are found under leaves and debris on the ground or in cracks and crevices on trees. Some larvae also overwinter 1 to 2 inches beneath the soil surface. The larvae pupate and the adults begin to emerge mid-June through October. After mating the female moths begin to lay single eggs near developing nuts. Eggs hatch in 8 to 10 days, and the tiny larvae search out nuts. They burrow into the nut to feed on the kernel for 2 to 4 weeks before they bore their way out. Most then form cocoons (hibernacula) to overwinter, although some may pupate and become moths within that season (i.e., there may be a partial second generation). Sprays are timed to target the eggs and the wandering early larvae before they penetrate the nuts. Note that spray timing is critical when selecting materials with lower residual, use the degree-day model available from the Integrated Plant Protection Center to predict optimal timing: http://uspest.org/wea/. Pest monitoring Filbertworm flight has been starting earlier in the season compared to historic norms. Previous recommendations were to start hanging pheromone traps before the flight of filbertworm moths begins in mid-June, but now it is clear that traps should be placed mid-May to capture the first moths. Use four traps for the first 10 acres and one for each additional 4 acres. Place the traps in the upper third of the canopy. Moth captures will not be representative if traps are not placed high in the canopy (pheromone is heavier than air). The action threshold is 2-3 moths per trap or five moths in any one trap. Note that very early moth flight may not threaten the crop if there are no nuts present. Apply insecticides 8-12 days after filbertworm moths emerge in your orchard block to target larvae emerging from eggs prior to nut penetration (first egg hatch occurs when 955 degree-days have accumulated after April 1). A second application may be necessary in 2-3 weeks, or if moths continue to be caught in traps at rates above the threshold. Moths flying late in the season can cause unexpected late crop damage so it is important to keep monitoring through harvest. Isomate FBW Ring is a commercial mating disruption product. Apply a minimum 20 dispensers per acre. Hang pheromone dispensers high in the canopy before initial moth flight. Continue to monitor traps and prepare to apply border sprays or supplemental cover sprays if traps continue to capture moths at rates above the threshold. Large, contiguous blocks under mating disruption are most effective. The continual release of pheromone from dispensers in the orchard interferes with the male moth's ability to locate females for mating within the orchard. Mated females originating from outside the orchard can still come in and lay eggs resulting in damaged nuts. Mating disruption technology is best applied to low to moderate filbertworm populations, so consider getting any problematic blocks under control before utilizing mating disruption. Do not apply to home orchards or orchards with steep slopes. First nut drop typically contains a higher percentage of nuts infested by flibertworm. Flailing or otherwise destroying these first nuts prior to harvest may reduce infestation levels. acetamiprid-Do not apply until after trees have flowered or when bees are actively foraging. Do not make more than one application a year. PHI minimum of 7 days. Filbertworm emergence notices are sent to growers. Time sprays accordingly. Pheromone trapping is encouraged for accurate spray timing. alpha-cypermethrin (Fastac CS) at 3.2 to 3.8 fl oz/a. PHI 7 days. REI 12 hr. Do not exceed 11.4 fl oz/a per season. Highly toxic to bees, extremely toxic to fish and aquatic invertebrates. Do not apply within 25 feet of aquatic habitats, or with 150 ft if aerial application. Apply as indicated by scouting. beta-cyfluthrin (Bathyroid) at 2 to 2.4 oz/a. PHI 14 days. REI 12 hr. carbaryl (Sevin XLR Plus or its equivalent in another formulation) at 0.5 to 1.25 quarts/100 gal water (2 to 5 quarts/a). PHI 14 days. REI 12 hr. May cause rapid increase of aphid populations 3 to 4 weeks after application. Extremely toxic to aquatic invertebrates. chlorantraniliprole (Altacor) at 3 to 4.5 oz/a. PHI 10 days. REI 4 hr. cyfluthrin (Baythroid XL) at 2 to 2.4 oz/a. PHI 14 days. REI 12 hr. emamectin benzoate (Proclaim) at 3.2 to 4.8 oz/a. PHI 14 days. esfenvalerate (Asana XL) at 8 to 12 fl oz/100 gal water (10 to 18 fl oz/a). PHI 21 days. REI 12 hr. Do not apply more than 0.2 lb ai/a per season. Extremely toxic to fish and aquatic habitat. flubendiamide (Belt) 3 to 4 fl oz/a. PHI 14 days. REI 12 hr. Drexel L-C at at 2.56 to 5.12 fl oz/a. PHI 14 days. REI 24 hr. Do not exceed 0.16 lb ai/a per season or 0.12 lb ai post bloom. methoxyfenozide (Intrepid 2F, Troubadour 2F) at 8 to 16 fl oz/a. PHI 14 days. REI 4 hr. Apply when egg hatch begins. Reapply at 14 to 21 day intervals under high pressure or sustained moth flight. Do not exceed 24 fl oz/a per application or 64 fl oz/a (1 lb ai/a) per season. Do not apply within 25 ft of an aquatic habitat, 150 ft if applied by air. Ambush 25W at 12.8 to 25.6 oz/a. PHI 14 days. Do not graze treated orchards. Extremely toxic to fish and aquatic habitat. Ambush 2E at 0.8 to 1.6 pints/a. PHI 14 days. REI 12 hr. Do not graze treated orchards. Extremely toxic to fish and aquatic habitat. pyriproxyfen (Esteem 35 WP ) at 3.2 to 4 oz/100 gal water (13 to 16 oz/a). Do not apply more than twice per season. PHI 21 day. REI 12 hr. spinetoram (Delegate WG) at 1.5 to 1.75 oz/100 gal water (4.5 to 7 oz/a). PHI 14 days. Apply no less than one week apart, with a maximum 4 applications per season. kaolin clay (Surround WP) at 50 to 75 lb/a. Suppression only. PHI 0 days. REI 4 hr. spinosad (Success 2L) at 1 to 2 oz/100 gal water (4 to 8 oz/a.) PHI 1 day. Do not exceed 29 oz/a per season. spinosad (Entrust SC) at 4 to 10 oz/a. PHI 1 days. REI 4 hr. OMRI-listed for organic use. tebufenozide (Confirm 2F) at up to 30 oz/a. PHI 14 days. REI 12 hr. Apply when egg hatch begins. Do not exceed 30 oz/a per application or 122 oz/a for the season.